Are dogs optimists or pessimists? This is Sandra Tsing Loh with the Loh Down on Science, saying: It depends on the dog. Animal scientists think the way dogs respond to cues can indicate whether they expect good or bad outcomes. In other words, whether they are natural optimists or pessimists! Melissa Starling at the University of Sydney tested a group of dogs to see which they were. She began by conditioning the dogs to two different tones, an octave apart. One tone was coupled with a bowl of tasty milk, while the other tone was coupled with boring water. After the dogs were conditioned, Starling played an ambiguous tone and observed the dogs’ reactions. 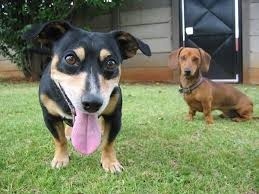 Dogs that responded with excitement to the ambiguous tone were considered optimists; those that reacted with indifference were considered pessimists. Knowing whether a dog sees the bowl as half empty or half full could be useful. A pessimistic pooch might avoid risks, making him a good candidate for a guide dog. That’s not to say you can’t trust an optimistic dog— just not to help you cross the freeway! Just sayin’!